Experience true amazement with a party hosted by everyone’s favourite master of illusion – the magician! 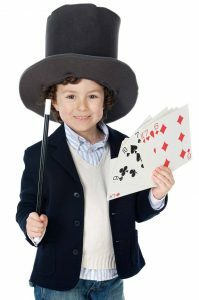 With a bag full of tricks and a few more up their sleeves, our Melbourne based magicians for hire are the perfect choice for any kids birthday party or special event. 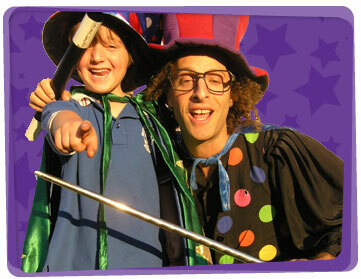 We have two different types of magic shows to choose from – one for the littlies and one for children seven years and above. The younger children love to see the magician in trouble as he continuously gets it wrong (on purpose) till he surprises every one with his grand finale. The older kids will be stunned, dazzled and bamboozled by the misdirection, trasmogrification and close up magic! 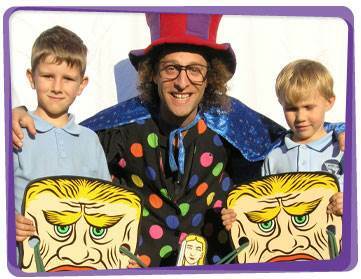 Our magicians for hire thrill children and adults alike at a wide range of popular events. Each child gets a deck of cards and some tape. On the go signal, the children start building their own house of cards and make it as tall as it can be within a given time limit. The child with the tallest house of cards wins. A reasonable time limit would be 5-10 minutes so the kids have enough time to make the card houses big and tall. If you have a lot of children, you can break them up into pairs or groups of 3’s. This way, everyone can work together on building the house of cards. If the group is too big, some children might not have the chance to work on it.